A charged particle beam which consists of ions is called ion beam. Multiple ion beam microscopes use gas field ion source technology which combine helium and neon ion beams (multiple ion beams) for applications across materials development, plasmonic research, semiconductor technology and lithography. Globally, rapidly rising semiconductor industry, and growing research and development sector are the prime growth drivers of multiple ion beam microscopes market. In addition, advancements in ion sources and development of nanotechnology, development of technologies to create high value multiple ion beam microscopes and increase in adoption of multiple ion beam microscopes in emerging economies such as China, India and others, will create new opportunities for multiple ion beam microscopes market. However, higher cost of operation and research and development, complex nature of the device and technological dependency, lack of awareness and lower penetration are the key restraints for multiple ion beam microscopes market. Geographically North America dominated multiple ion beam microscopes market owing to higher demand in countries like U.S., owing to higher adoption of nanotechnology and growing government grants for developing the research and development sector. Asia Pacific is projected to have fastest growth, owing to rapidly increasing application of multiple ion beam microscopes in manufacturing and semiconductor industry, rising semiconductor industry, increasing in the research and development sector, and favourable government policies in developing nations such as China, and India in this region. Among all the application, failure analysis has the highest market share in multiple ion beam microscopes market. This report identifies the multiple ion beam microscopes market size in for the year 2015-2017, and forecast of the same for year 2025. 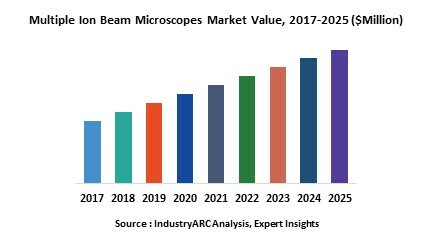 It also highlights the market drivers, restraints, growth indicators, challenges, and other key aspects with respect to multiple ion beam microscopes market.